Marijuana stocks mostly got crushed last month, but REIT Innovative Industrial Properties escaped with relatively little damage. Innovative Industrial Properties (NYSE:IIPR) stock declined 15% in October, according to data from S&P Global Market Intelligence. But it's already up 8.6% in November, through Friday, thanks to a 6.7% jump on Thursday. For some context, the S&P 500 index was down 6.8% last month and has returned 2.7% so far this month, through Friday. Innovative Industrial Properties is a marijuana industry-focused real estate investment trust (REIT). It targets properties in states where marijuana is legal for medical use. 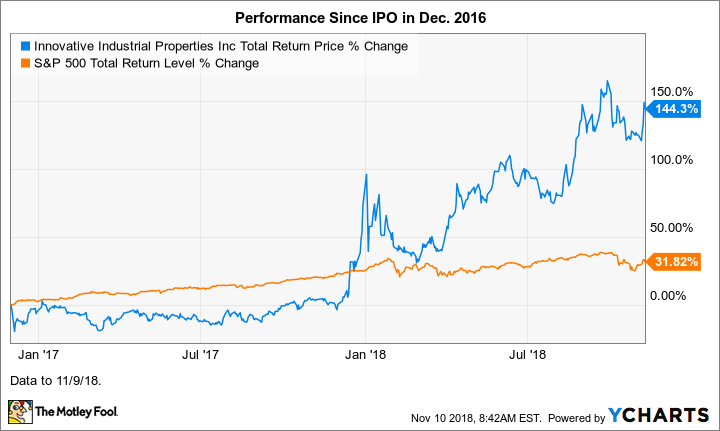 We can attribute Innovative Industrial Properties (IIP) stock's drop last month to the cannabis sector pulling back after running up during the late summer in anticipation of Oct. 17. That's when marijuana became legal for adult recreational use in Canada. Nearly all of the companies in the space saw their share prices drop considerably. IIP stock's 15% decline was actually quite mild. Shares of Tilray, Canopy Growth, and Aurora Cannabis -- the big three by market cap -- plunged 34%, 24.2%, and 29.2%, respectively, in October. Of course, IIP stock didn't run up in late summer as much as the shares of most of the major players (Aurora excepted) either. In general, it's a less volatile stock. That's largely because it's indirectly involved in the marijuana industry, rather than directly, and because it's organized as an REIT, which means that in return for favorable tax treatment it must pay out at least 90% of its income as dividends. On that note, shares are currently yielding 3.15%. IIP stock's strong start to November can be attributed to the company's release of robust third-quarter results on Wednesday after the market close. Fueled by acquisitions, revenue jumped 152% year over year to $3.93 million, earnings per share soared 133% to $0.21, and adjusted funds from operations -- which is akin to "earnings" for REITs and drives dividend payouts -- rose 81%. Of course, a massive opportunity will come when cannabis is legal on a federal level in the U.S., though that milestone is probably quite a bit out in the future.